Social Media is great for staying in touch with family and friends. It can also be used to educate and inspire. Such is the case with Pope Francis and his Twitter account. 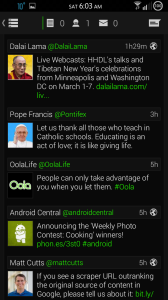 When it was first announced that the Pope would be tweeting it got plenty of media attention. I’m not Catholic but I decided to start following His Holiness to see what all the buzz was about. I’m glad I did. He is very good at educating and inspiring in 140 characters or less. It’s always nice to have something like those pop up in your Twitter feed to balance out some of the negativity. One interesting note. 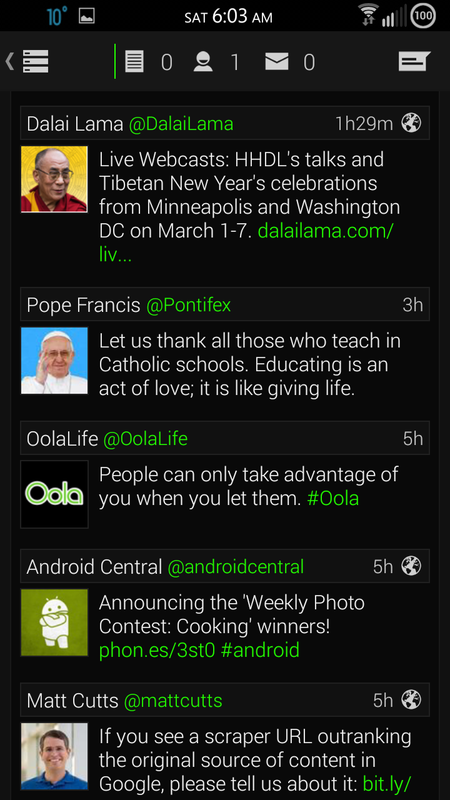 I also follow the Dalai Lama on Twitter and I think he and the Pope have the same tweeting schedule. Their tweets are usually very close to each other in my Twitter feed. Here are a few of the other people I follow on Twitter for a little education, inspiration, and even a few laughs: Jon Acuff, Andy Andrews, Adam Weber, Dan Miller, Dave Ramsey, Chris Hogan, Tom Corely, Joyce Meyer, Rick Warren, Joel Osteen, and Tony Dungy. Who do you follow on social media that educates and inspires you? Let me know in the comments so I can start following them too! Previous PostStreaming SuccessNext PostWeek 11 Verses – Hello Spring!